A fireplace helps create a unique atmosphere on your patio or in your garden. Start a fire on chilly evenings so you can grill with your friends late into the night. 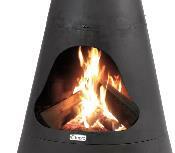 The outdoor fireplace "Norfolk" perfectly combines the functional with the aesthetic. Its straight lines and large flame opening make the fireplace an interesting eye-catcher. With the fireplace "Norfolk", a unique and restful atmosphere is guaranteed. Please note: this item is supplied direct from supplier, allow 10 days for delivery.